I feel we live in an image saturated culture. But what if we could get back to language? Would this clamber for the ‘word’ change our lives again – make us more rational, clear, harsh, in our thinking? This harshness is required methinks if we plan to progress as a culture – we can not live in more & more emotions if we plan to develop – individually or as a group. The ‘word’ is stark against a backdrop – it is or is-not. It is read in a direction – depending on the language or script of local use or tradition. Images suffer from no such delineation. It is with just that delineation of language that will force us to stop and think – as opposed to just going on and on (like pictures do) without order or rigor. That is the space where we learn. This entry was posted in Language Studies, Writing and tagged Philosophy, Words. I am beginning a new library job tomorrow, a job that will revolve around Middle East and Arabic studies. I will need to learn Arabic. 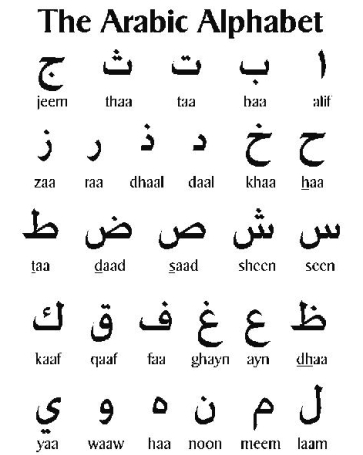 Who can suggest to me the best resources and methods for learning, not only to speak, but also to read, Arabic? You can drop those recommendations into the reply box below or reply to me on Twitter: @jlibraryist. This entry was posted in Language Collections, Language Studies, libraries, Special Collections and tagged Arabic, language learning.